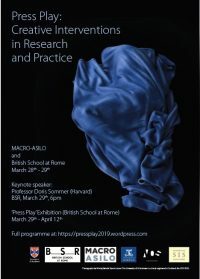 You can find information about events of interest to the Italian Studies UG community in this section: see, in particular, ‘Prizes, Grants and Bursaries’. The Society for Italian Studies is committed to supporting postgraduate students working in all fields of Italian Studies. Through its activities, the Society aims to foster a strong postgraduate community, and to encourage postgraduate research by facilitating exchange between academic researchers at all career stages in the discipline of Italian Studies. The Society sponsors an annual Postgraduate Colloquium, and contributes to a number of bursaries and prizes. You can find information about events of interest to the Italian Studies PG community on our Facebook page: Please feel free to join the page and give us your feedback. access to the SIS and its academic contacts and support.